Venezuelan government officials say that two explosions at a military assemblage in Caracas on Saturday was in fact an attempt on President Nicolas Maduro’s life using bomb-carrying drones – and though the exact nature of just what happened is still being disputed, the idea that it indeed involved bomb drones isn’t as far-fetched as it sounds. ... Firefighters at the scene of the blast disputed the government’s version of events. 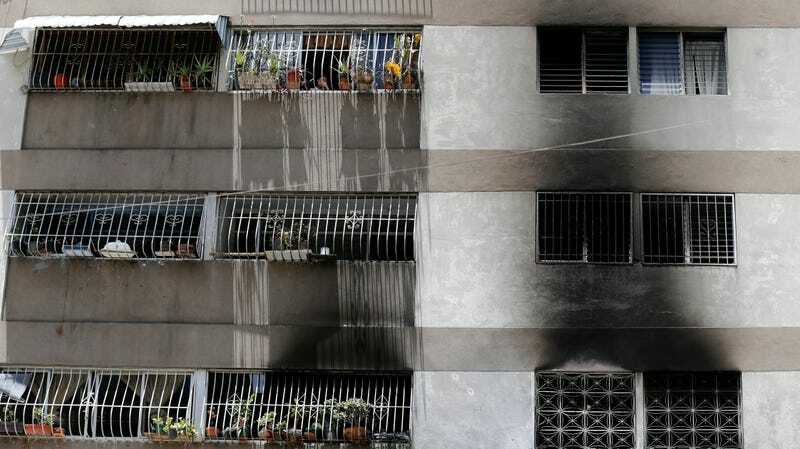 Three local authorities said there had been a gas tank explosion inside an apartment near Maduro’s speech where smoke could be seen streaming out of a window. They provided no further details on how they had reached that conclusion. Maduro, who has held office since 2013 after taking over from predecessor Hugo Chávez, has increasingly turned to authoritarian tactics as his country grappled with a devastating economic crisis. He was re-elected earlier this year, though amid poor poll showings, widespread allegations of fraud, and a general lack of faith in the democratic process. According to the AP, another little-known group called Soldiers in T-shirts took responsibility, saying that they had flown two drones laden with C4 explosives at Maduro but government sharpshooters had taken the drones down. It’s not clear what that group is or whether the claim of responsibility was a hoax. According to the Washington Post, one “military expert and former member of the armed ­forces” said that the event was real and not staged by the government. Control Ciudadano head Rocio San Miguel, another military expert, told the paper she believed it was probable that the government had simply lost control of one of their own drones and destroyed it before it could hit the presidential podium. Washington Office on Latin America regional expert David Smilde told the AP initial signs were that the attack was not staged, because the images of Venezuelan soldiers running for cover and Maduro being swarmed by bodyguards made his already unpopular government look weak. If true, the attack would have ample precedent. The U.S. military has long used drones for targeted assassinations, and an increasing number of other militaries have begun to deploy their own drones of varying levels of sophistication. More similar to the Venezuelan government’s description of the incident are the drones used by terror group ISIS, which has infamously deployed off-the-shelf consumer drones strapped with explosives for years, as well as operated entire workshops dedicated to building or retrofitting unmanned vehicles capable of carrying deadly payloads in Iraq. Per Wired, virtually all of the methods for defending against drones come with some caveats. Radio frequency jammers that interfere with operator control also potentially interfere with other radio communications. Geofencing, or software restrictions on where drones can be flown, can be bypassed simply by installing modified firmware. A Dutch trial to train eagles to capture rogue drones failed when the birds did not always follow their training, and could have simply resulted in serious injuries to the eagles involved anyways. Just shooting the things is always a possibility – and the U.S. Navy has been testing lasers that do that – but does require someone with really good aim be on hand.